Have you seen the movie, How To Train Your Dragon? In the movie, there is a black dragon, a Night Fury, named Toothless. 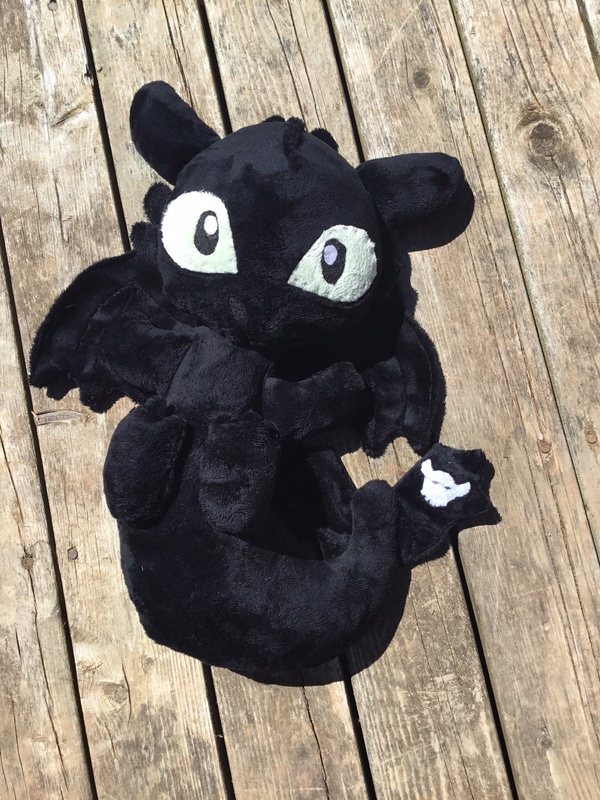 I found a pattern online to make a Toothless stuffy and I set about to do so for an artisan showcase. This was not an easy sew. The difficulties began with the fabric, minky, a super-slippery fabric. However, it makes the softest and cuddliest stuffies. It took me over an hour just to cut out all the pieces. Toothless has many tiny scales and spikes. Putting him together took quite awhile as well due to lots of fussy sewing. So many tiny pieces, and not only tiny but curved as well! I’m not much for the fiddly sewing like that, but I gave it my best go. All that said, I could not be more pleased with how he turned out! It’s hard to get a good picture of him, since he’s all black, and his nostrils are black glitter felt. Most of the little scales and spikes are on his back. You can get the idea from this picture though. I doubt I will ever make another one because of how fussy it is. Also, I’m super happy I didn’t sell him at the showcase because he’s just so darn cute! I want to keep him for myself… I won’t even share with the kids! I also made a dinosaur, some elephants, and some owls. I haven’t snapped any photos of those just yet. They’re cute, but not as nice as Toothless here. If you’re interested in the pattern you can find it here. Previous postBaking up a storm! Next postChildren’s Ministry Decorating Challenge.